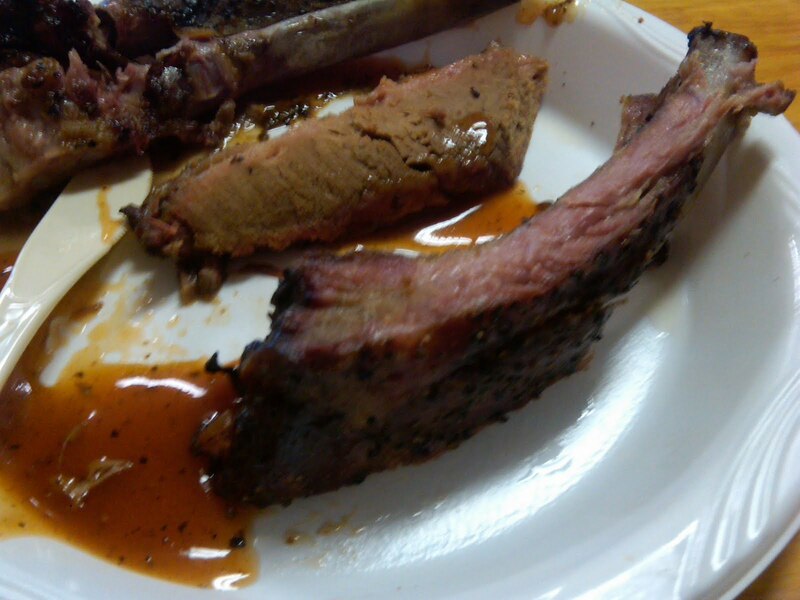 My post yesterday about the possibility of microwaved BBQ sparked a post from Larry Gaian, over at The BBQ Grail, entitled The 25 Undeniable BBQ Truths. Check it out & weigh in! 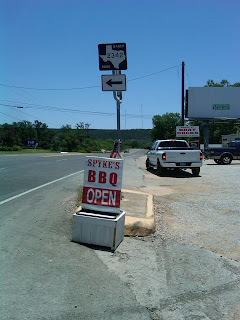 A few Saturdays ago, I stopped into Hart's Firehouse BBQ in Lampasas for a noontime lunch. Unless my eyes and ears were playing tricks on me, the two customers in front of me in line had their sandwich orders heated up in the microwave. So, I decided to take some pics and look for lunch elsewhere. I'm sure I've been served nuked BBQ, but never to my knowledge. Anyone else ever seen this? *Reminder: Through July 4, you can enter to win a $50 sampler of sauces, rubs, & seasonings from Iguana Isle (Naples, FL)!!! 4Rivers Smokehouse (Winter Park and Winter Garden, Florida) - "From President of a $1.4 billion pharmaceutical operation to pit master of one of the most talked about barbecue restaurants in Florida, 4Rivers Smokehouse, John Rivers’ career is a recipe for success. A Floridian turned Texan, John stepped out of 20 years in corporate America to pursue his dream of opening a traditional Texas smokehouse in Florida as a platform to introduce his 18-hour, slow-smoked Angus brisket in what was otherwise considered a pork dominated market." Podnah's Pit Barbecue (Portland, OR) - "By the time Rodney Muirhead opened Podnah's in late 2006, he'd already been smoking Texas style barbecue in Portland for almost 4 years. He started his barbecue career as one half of L.O.W. BBQ--the somewhat itenerant fellas who had pit-on-trailer and did travel. Rodney and his partner sold L.O.W, and Rodney went to work in some other fine local restaurants, all the while dreaming of opening his own place. Rodney realized that dream in the summer of 2006 when he found a partner and a space for what would become his new barbecue restaurant. To honor his Texas roots, he named it "Podnah's Pit" after his grandfather's nickname--"podnah" being Texan for partner. Podnah's barbecue has been praised by publications from the Willamette Week to Bon Apetite magazine. There's a really simple explanation for Rodney's success: he don't mess with Texas. While many things have changed since Rodney started barbecuing back in 2003, there's one thing that will always stay the same--relying on the barbecue methods of the Lone Star state." Which of these beer-based BBQ sauces most strikes your fancy? How will you heat your meat? More to win from Iguana Isle! The pot in our Iguana Isle giveaway just got sweeter. In addition to the 4 ways you can enter for your chance to win the $50 sampler, Iguana Isle is throwing in a second $50 sampler. To enter to win this one, simply start following Iguana Isle on Twitter and/or Facebook sometime before the end of July 4. Click of your mouse or mousepad, and you're entered! Did you know you can rent a cooker/smoker for your gathering, event, whatever? Well, you can, thanks to the folks at Texas BBQ Cookers. The units even come complete with cooking instructions for your Texas BBQ protein(s) of choice. Here is the company's lineup of cookers. I'm sure there are other companies that do this, so if you know of one, let me know. 3. Retweet any of our Twitter posts about this giveaway. 4. Click "Like" and/or leave a comment below this Facebook post. All entries must be received by 11:59 PM CST on July 4. Regardless of whether you win, get this: Iguana Isle now offers Free Parcel Post Shipping on all orders over $25.00 with the code "MUTB" at checkout!!! *UPDATE: Iguana Isle has graciously thrown in a second sampler! 2 ways to enter to win it. A couple of weeks ago work took me out to the highland lakes area and Marble Falls, Kingsland and Llano. I decided to take advantage of the opportunity and get some BBQ in an area I rarely go. My first thought was to make my first visit to Cooper's. 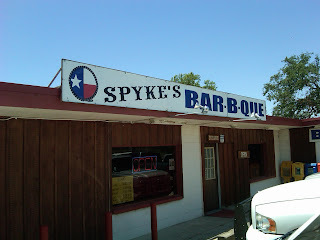 Instead I decided to try Spyke's BBQ in Kingsland since there were no entries about it on the blog. The place is easy to find since it's got a great location on 1431 only a couple of hundred yards before you cross the river. The building's unassuming from the outside, and ordering was about as straightforward as you can get with one counter. I opted for a half pound of pork ribs and a third pound of brisket along with a side of beans. The pork ribs were fantastic. They had a nice pepper crust and the ones I got seemed pretty meaty for a pork rib. 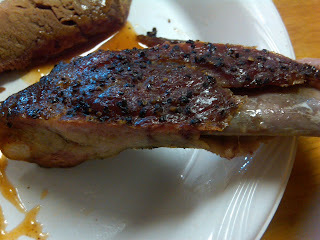 The consistency of the ribs was almost fall of the bone, and they had plenty of flavor. The brisket was also great. I thought at first glance it might be a little dry, but there was more than enough moisture in the brisket. I think I ended up with more a leaner cut since I didn't specify at the counter, but I was still content with it. The small amount of fat I did get with the meat was rendered perfectly. The beans were decent, but not really worth talking about. Spyke's also had what I'm guessing is a homemade BBQ sauce. I kept trying to decide how much I liked it but couldn't come up with an answer other than it's good. I didn't really ask around about the place since I was in a hurry to get back to work, but pictures on the wall showed a car that had driven through the front of the store at one point. So I'm sure there's plenty of character and history with Spyke's, especially since it seems to be one of the only BBQ places in Kingsland. What's your Texas BBQ joint's slogan? Meyer's Elgin Smokehouse July 4 Giveaway!!! What would you name your Texas BBQ joint? BBQ returns to Pecan Lodge! John Mueller to open BBQ joint in Austin! Where would you open a Texas BBQ joint? The Q Card turns 1!! !